Artist Nicholas Reti sits on a bench at the Denver Public Library admiring a painting by the renowned Hudson River School artist Albert Bierstadt (1830-1902). 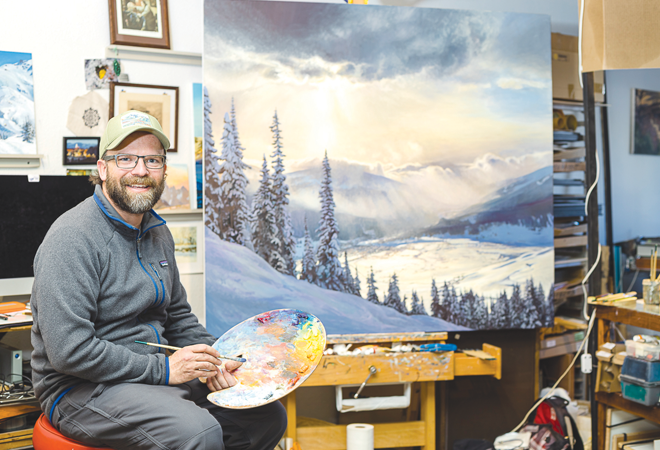 His focus is not only on the Bierstadt but the painting hanging next to it—his own, for which he won first place at the Denver Plein Air Arts Festival in 2007. His richly hued painting, “13th Ave.,” depicts what was then the new Denver Art Museum’s cantilevered building and its summer streetscape. In his Rocking Horse Plaza apartment in Crested Butte, Nicholas speaks in the language of visuals, illustrating his thoughts with paintings, art books and examples through life, words and concepts expressed with color and content. His home itself is a masterpiece with paintings, original prints, and sculptures, art of every medium, not only of his own work but artists from all over the planet, covering every square inch of wall, tucked into slotted closets overflowing with stored painted canvases, or lined along the floor baseboard and dozens more on bakers’ racks. 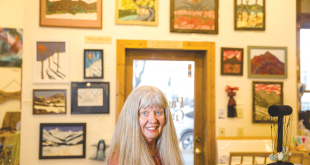 His life is a living museum tucked away in a corner of Crested Butte. Like a museum does, Nicholas rotates the display of art on his walls. At the moment, a work in progress dominates the center of what would be a living room for most but is functionally Nicholas’ studio—an enormous unfinished painting is poised on his easel, the Crested Butte sky bursts forth with luminescence as clouds stretch across a breathtaking local mountain scene. He captures the essence and details so well that you feel as though you are part of the familiar landscape as the day breaks forth. Nicholas was born a California kid, spending the first ten years of his life in Palo Alto. One of four children, he lost his mother to spinal meningitis when he was only three. His father remarried less than two years later and in 1989, they moved the family to Littleton, Colo. to start a solar heating company before becoming distributors for Mountain Man Fruit based out of Parker, Colo.
As a first-generation American, Nicholas describes how his family had escaped Budapest in 1956 during the Hungarian revolution. He explains that his grandparents took him around the world so he could experience different cultures. He says, “We were going into the best museums in every city so I was being exposed to the best art from around the world from the age of ten through the time I was 15.” He returned to the family motherland of Budapest for a visit in 2000 with his paternal grandparents, only after the wall fell. Throughout his childhood they also traveled to Egypt, Israel, France, Turkey, England, Indonesia, China and throughout the United States, hiking all over national parks. When he was 15, he attended the Marie Walsh Sharpe Foundation at Colorado College, a two-week summer intensive art program where you live and breathe art with others the same age. He was inspired, and it set his course. He’d skip gym class in favor of art class and ski patrol, the latter giving him the needed gym credits while he skied A Basin for three years. After graduating from Chatfield Senior High School in 1997, Nicholas received a full scholarship to Minneapolis College of Art and Design, where he earned his BFA in fine art painting in 2001. During his time at college, Nicholas studied abroad in Paris for six months at Parson’s School of Art and Design. “It was so much fun. I got to do runway sketching because it was known for fashion design,” he says. He then moved to Florence, Italy, for the second part of the year to study at Artistico Porta Romana. “I lived close to the Louvre in Paris and the Uffizi in Florence. I went to all the museums, taking in the best culture of the places I lived. After college, Nicholas immediately returned to the Front Range. 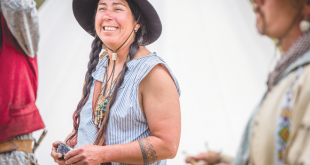 “I did a whole bunch of everything while sporadically selling paintings in galleries and I was teaching photography at the Denver School of Photography. I was asked to photograph Bush #41, George W. #43 and their wives and daughters for the Republican National Committee every time they came to Colorado during the 2004 campaign. I had to make up a letterhead design to send to the White House to bill them because I didn’t have any,” he laughs. “Here I was, hanging out with AP photographers, listening to them talk about what it was like to be a professional press corps photographer and from what I heard, they were so bored and so over it. They heard the same speech every day along the campaign trail and I thought to myself, this is not the career I want. I was 25 years old and photographing the president. I pretty much knew that wasn’t the direction I wanted my art career to take,” and in making that decision, he went to the best portrait photographer in South Denver, who hired Nicholas to manage and expand his child portrait studios. Nicholas wisely decided to take a non-stress job in an art supply store for $8 an hour, which provided him with cheap art supplies. In August 2008, he headed to the mountains to clear his head. He’d already discovered Crested Butte during the Crested Butte Arts Festival, where his work sold exceptionally well the year prior. The sales were enough for him to go back to Denver, quit his job and start preparing for the next year’s Art Festival. Meanwhile, Oh Be Joyful Gallery began to represent his work, having sold a painting out of the gallery during the Art Festival. He moved up in October 2010. He felt liberated in a town that embraced eccentricity. “From the day I moved here, I made the decision that I had to support myself full-time by painting. When you decide to go full-time with your art, you can’t allow yourself to not believe in yourself—as soon as you take a job, you’re telling yourself you’re not good enough,” he reasons. Nicholas says, “What drives the art sales more than anything is empty walls and new homes, second home owners, second generation families that have been coming here for decades. The local artist succeeds when the economy succeeds, we parallel. I’m chasing that line of affordability—it’s constantly going up and the artists are short to follow behind that rising tide of success. We’re only riding that wave after everyone else comes through because we didn’t make our money on Wall Street,” although he points out that when the stock market does well, so do artists. “There’s a clear correlation, when people are flush with money, they’re spending more on luxury items. Although,” he smiles, “we feel that art is essential luxury.” In 2015, Nicholas took over the Oh Be Joyful Gallery on Third Street, in which he had been represented for seven years. Nicholas has been working on a project he conceived and started researching three years ago and he hopes to turn it into a museum exhibit. He’s created a brochure of his extensive research, The History of Art in Crested Butte, but it extends throughout the valley and his endless investigative studies have revealed that the history carries back even well before the 1853 artifacts, photos and art pieces he’s discovered. 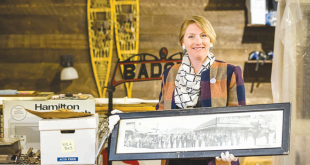 He’s uncovered 116 Gunnison Country artists and businesses between 1853 and 1970 and has accumulated a massive collection of artifacts, photos, articles, digital images and biographies, almost 4,000 objects that tell the story. The Creative District awarded Nicholas’ project two different grants over the last year. The first funded the initial research and the second grant funded a seven-minute film, released in November. His gallery and a few patrons have funded the additional expenses for research as well as the acquisition of historic objects. He believes that by creating a museum, patrons will want to fill it with fine art for future generations. “For the same reason there was support for the center I believe there would support for an art museum based on the fact that we have a depth of arts to experience in our community, and that is due to the support of the patrons and their desire to be a part of a creative community.